Our April issue of Nova et Vetera has some of the latest news about the continuing dialogue with the hierarchy in Rome. In Europe many rumours are abounding about agreements being made, compromises being reached and so on. Mgr. Fellay in recent sermon at the Society’s seminary in France dismissed the whole speculation as so much ‘rubbish’. The full text of his sermon is reproduced here. On the ‘old’ side we print the full text (already quoted in part in a previous issue) of the reply Mgr. Lefebvre wrote to Cardinal Ottaviani just after the Council finished, which is referred to by Mgr. Fellay in his sermon. We introduce to Southern Africa: Rev. 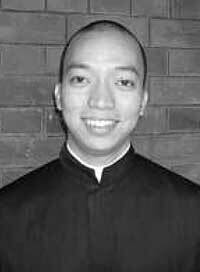 Carlo Magno Saa (pictured) who joins us from the Philippines to replace Rev. Thomas Hufford who has been called back to his country of origin, the United States. Fr. Saa presents us with a brief history of the Philippines this month before going on to describe the development of the Society’s apostolate there in a later issue. We wish Fr. Saa a fruitful apostolate up in Harare and ask all our readers to pray for a satisfactory solution to the present visa difficulties experienced by our confreres beyond Beit Bridge. Otherwise, as this issue reaches you we shall be in Passiontide preparing with renewed fasting and penance for Holy Week and the joy of the Resurrection. The staff and contributors of Nova et Vetera take this opportunity of wishing all our readers God’s abundant graces at this holy time.